Throughout the guide is a detailed description of the route to be taken. This is particularly well written and comprehensive. 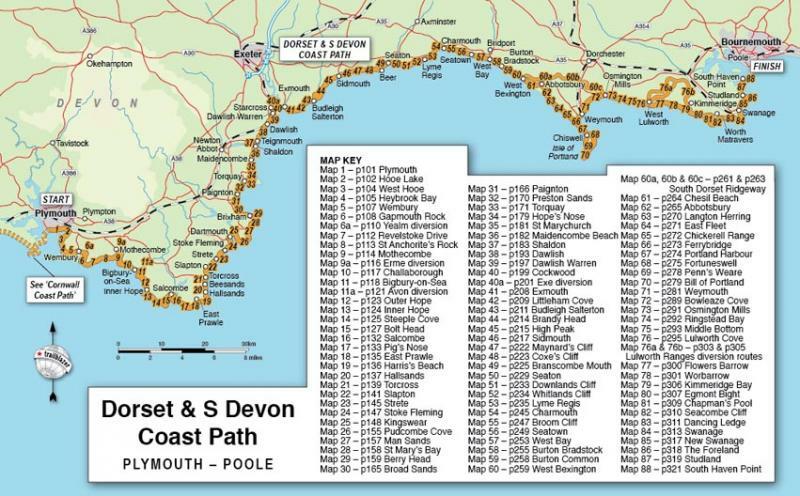 This guide covers the third and last section of the South West Coast Path, from Plymouth to Poole Harbour (217 miles). This beautiful route includes 95 miles within England’s only Natural World Heritage Site, the Jurassic Coast, and passes dramatic cliffs and headlands, Chesil Bank’s impressive spit and Lulworth Cove, winding through idyllic seaside villages such as Beer and Lyme Regis. 1. Unique mapping features – In many walking guidebooks the reader has to read a route description then try to relate it to the map. Our guides are much easier to use because walking directions, tricky junctions, places to stay and eat, points of interest and walking times are all written onto the maps themselves in the places to which they apply. With their uncluttered clarity, these are not general-purpose maps but fully-edited maps drawn by walkers for walkers. 2. An all-in-one guide – Trailblazer guides include practical information not usually found in walking guides to the UK: places to stay, places to eat, attractions along the way and public transport information.